Deep red guajillo peppers are the workhorse chiles of Mexico. 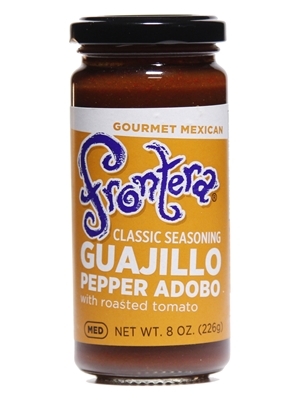 We've blended them with roasted tomato adobo sauce for use in everything from salsa and sauces to soups, stews and grilled fish. Ingredients: Guajillo chiles, filtered water, roasted tomato, onion, tomato paste, ancho chiles, garlic, organic distilled vinegar, evaporated cane sugar, salt, oregano.